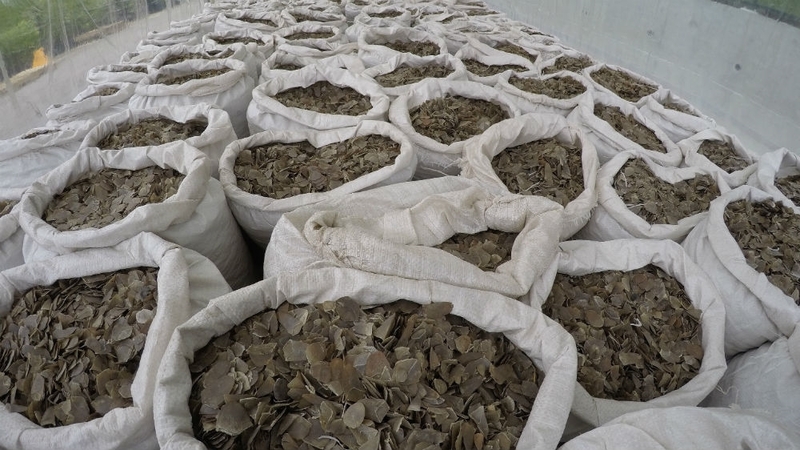 Singapore has seized nearly 26 tonnes of pangolin scales – the biggest ever recorded – in two separate operations over the past week, fuelling calls for improved protection for the endangered species. The scales, linked to four types of pangolin in Africa, would have together come from 38,000 pangolins. The latest shipment was found on April 8 in a shipping container on its way from Nigeria to Vietnam which was labelled as “cassia seeds”, a statement from the National Parks Board, Singapore Customs and the Immigration and Checkpoints Authority said on Wednesday. The scales were packed into 474 bags. On April 3, Singapore authorities discovered 12.9 tonnes of scales, shipped as “frozen beef”, hidden in another container on its way from Nigeria to Vietnam. That shipment also included 177kg of cut up and carved elephant ivory, said the authorities. “The sheer size of these two latest seizures is unprecedented and will undoubtedly prove a major setback to the traffickers concerned,” said Richard Thomas of Traffic, which monitors the illegal trade in wildlife. But he warned the seizures would not put the traffickers out of business. “The quantities of pangolins involved point to sourcing, processing and distribution on an industrial scale,” said Thomas. The pangolin, once common across Asia and Africa, is a shy and largely nocturnal type of anteater that rolls up into a ball when it feels threatened. It is protected under the Convention on International Trade in Endangered Species, as well as under national laws. It is said to be the most widely trafficked mammal in the world, with the keratin scales that cover its body touted as a cure in traditional medicines in Asia. Keratin is the same material as human fingernails. Wildlife groups are concerned pangolin poaching is increasing. “The World Health Organization recently endorsed traditional medicine and the industry appears keen to grow this market outside of China, Vietnam and beyond,” said Neil D’Cruze, the global wildlife adviser at the World Animal Protection. Pangolins can be a lucrative catch for rural communities, with poachers making the equivalent of a full year’s salary from catching a single pangolin, said D’Cruze. The traffickers who act as middlemen also make substantial profits from the trade that’s reaching more remote communities to hunt the animal, he added. The maximum penalty in Singapore for the illegal import, export and re-export of wildlife is a fine of up to $500,000 and/or a prison term of two years. The same penalties apply to transhipment of illegal wildlife species. In February, Malaysia uncovered a pangolin-trafficking ring in its Borneo state of Sabah, recording the country’s biggest haul of pangolin and pangolin products. The same month, Hong Kong also intercepted an illegal shipment of ivory tusks and pangolin scales, which was on its way to Vietnam.